In addition to Kent’s work and dedication to quality performance, he leads a distinguished life and career in educating young and upcoming musicians. After graduating with a Master’s in Music from University of North Texas in 1983 and immediately becoming active in the Dallas/Ft. Worth music scene, he joined the faculty of the Booker T. Washington High School for the Performing and Visual Arts. As a mentor to generations of musicians who began their musical studies at Dallas’ Arts Magnet, he has taught many great musicians produced by the school. He is now the Music Director there and directs the school’s acclaimed Jazz Singers, again using his talent to work with singers and promote Jazz. 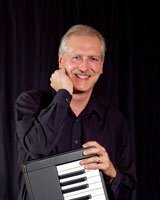 He is also the jazz piano instructor for Collin County Community College in Plano and is a performing member with the faculty jazz group. In addition, Kent is the music director for the Cathedral of Light Church in Carrollton, where he has been involved musically since 1991.